OK, so I have a few machines that need fixing. I have just moved house and have finally got a bit of a work area that doesn't mean the kitchen table. I have successfully repaired a few boxes over the years and probably forgotten more than I can remember. Gear is limited but spirits are high. I have to fix, in no particular order, two Mega ST's, Megafile 30, Mega STE, STFM (Maybe - I have 5 more), 2600 130XE and an A2000 for good measure. I picked the easy one to start (yeah, right) the Mega ST's. I have managed to get one up and running this week. It was a Mega2 with weird pink artifact junk all over the screen. First fault was me being asleep at the wheel. Once I had a look at the board I could see that the RAM caps had been removed and so had C140, a 1000uf axial cap. In true cowboy fashion I went and bought a new 4700uf and 1000uf cap and 16 220nf's for the RAM. Fired her up and got some more funny results. I pulled the 1000uf cap back out and managed to get the black screen with white boarder. Ho-ray. I found this a bit interesting as the PSU then promptly dropped its lunch. Dead as a dodo. Now the interesting bit, I hot wired a CD ROM psu and got the board to boot with a 2 chip TOS 1.02 set. Great, try a 6 ship 1.04 I have lying around. Nada - white screen, no floppy access. A bit of back and forth and I noticed a couple of things. The CD ROM psu is rated at 2 amps, not much. 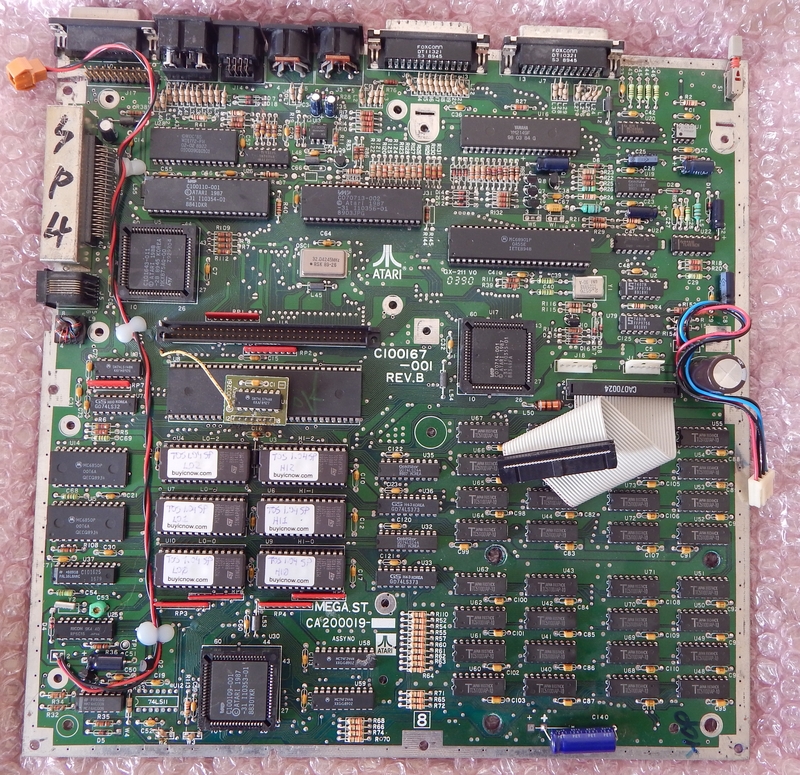 I also tried firing the other Mega 4 board I have before the other PSU died, black screen, white boarder. Hmmm. Same result with the CDROM psu later on that board too. So I have a theory, yes, I have board problems. But, I think my biggest problems are PSU. If I drop C140 back in or the 6 chip set then it won't boot - white screen. I think the load may be too much for the CDROM psu and because the original PSU was failing, it exhibited similar problems and confused hell out of me. Next trick fix or replace the PSU and test the theory, then continue from there. I tell you what, I forgot how much of a thrill it is to get the ANcool megademo fired on a dead box up after going to town with a soldering iron after it sitting in a shed for 15 years. I love it. Now I just need to get it running properly. Assume you changed the jumpers for 6 chip TOS ? Similar with STF series in fact. Yup, jumpers set correctly. I think it is the extra load that gave me the trouble and I misinterpreted that. Both boards were 6 chip originally. Do you know what C140 actually does? Do you know what C140 actually does? Where abouts is it on the schematic ? It looks to be a filtering cap, but it isn't clear to me. Big axial cap, right at the bottom. ah, main smoothing cap. If it works without it then you have a noise problem most likely. Swapping the address & databus arrays for 2.2K will most likely help. You mean the 16x 33 ohm resistors, right? STFM's don't have this cap.